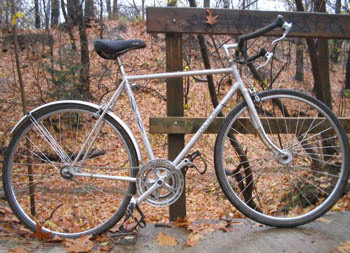 When this fine example of the Cheap Old Ten Speed turned up in a neighbour's "free stuff" pile one night, I grabbed it. The 165mm cranks and big clearance the frame gave with 700c wheels made up my mind for me. It had to be turned into a combination offroad, bad weather, and coffee bike. I put on wheels from another fixie project, and put the brake pads at the bottom of the long reach centrepull slots to make the most of the tire and mud and fender clearance. (Thanks to the i-BOB list for the tip of running the old non-aero brake levers with the cable reversed.) Using advanced fabrication techniques I managed to melt and bend a Zefal mountain bike fender and fit it under the back brake, but I'm still looking for a suitable front fender. The tires are Continental City Grip, 57mm by the sidewall and 35mm by my ruler. I prefer clipless pedals on a fixed gear, but I was recently lured into the dark netherworld of long distance running and I needed one of my bikes to be ridable in running shoes. How does it ride? Pretty well. The trick to building an enthusiast's beater is to keep the the surface crappiness and upgrade contact points and moving parts. "Fixing" a bike eliminates most of the moving parts and hence most of the underlying clunkiness. The cowhorn bars are equally good on the trail and in traffic. It isn't light--the frame is definitely steel--but without all the bits it isn't heavy either. The outer ring and chain guard are swaged on, but since they do a good job of keeping my jeans out of the chain I don't mind. It's still a work in progress. On the cards for the next rainy day are installing some better brake levers I've got lying around somewhere, and adding a bottom bracket generator that's to be operated by a bar end shifter. Adam Tatarnic lives in Toronto and has been riding fixed for five years.